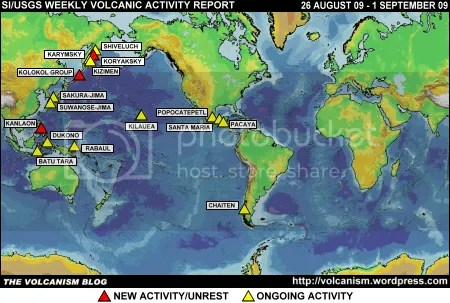 Posted by admin in activity reports, Caribbean, Chaitén, Chile, Colombia, Dukono, Ecuador, El Salvador, eruptions, Galeras, Guatemala, Hawaii, Indonesia, Japan, Kamchatka, Karangetang, Karymsky, Kilauea, Kliuchevskoi, Koryaksky, Mayon, Nevado del Huila, Papua New Guinea, Philippines, Piton de la Fournaise, Rabaul, Reventador, Russia, Sakura-jima, Santa María, Shiveluch, Soufrière Hills, Suwanose-jima, United States, Weekly Volcanic Activity Reports. The Smithsonian Institution/United States Geological Survey Weekly Volcanic Activity Report for 4-10 November 2009 is available on the Global Volcanism Program website. The following is a summary and not a substitute for the full report. New activity/unrest: Batur (Indonesia), Galeras (Colombia), Karangetang [Api Siau] (Indonesia), Mayon (Philippines), Nevado del Huila (Colombia), Piton de la Fournaise (Réunion), Reventador (Ecuador), San Vicente (El Salvador). Ongoing activity: Chaitén (Chile), Dukono (Indonesia), Karymsky (Russia), Kilauea (Hawaii, USA), Kliuchevskoi (Russia), Koryaksky (Russia), Rabaul (Papua New Guinea), Sakura-jima (Japan), Santa María (Guatemala) Shiveluch (Russia), Soufrière Hills (Montserrat), Suwanose-jima (Japan). Posted by admin in activity reports, Batu Tara, Chaitén, Chile, Dukono, eruptions, Hawaii, Indonesia, Japan, Kamchatka, Kilauea, Koryaksky, Mexico, Nicaragua, Papua New Guinea, Popocatépetl, Rabaul, Russia, Sakura-jima, San Cristóbal, Shiveluch, Suwanose-jima, United States, Weekly Volcanic Activity Reports. 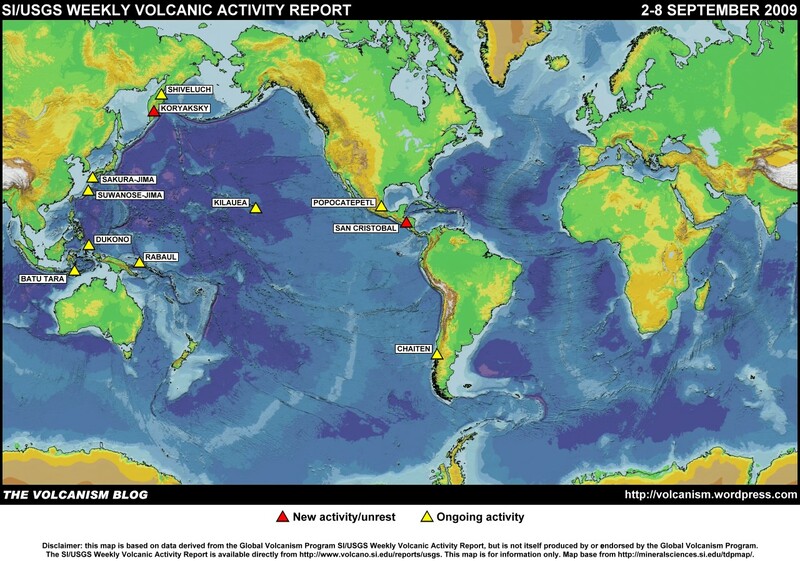 The Smithsonian Institution/United States Geological Survey Weekly Volcanic Activity Report for 2-8 September 2009 is available on the Global Volcanism Program website. The following is a summary and not a substitute for the full report. New activity: Koryaksky (Russia), San Cristóbal (Nicaragua). Ongoing activity: Batu Tara (Indonesia), Chaitén (Chile), Dukono (Indonesia), Kilauea (Hawaii, USA), Popocatépetl (Mexico), Rabaul (Papua New Guinea), Sakura-jima (Japan), Shiveluch (Russia), Suwanose-jima (Japan). Posted by admin in activity reports, Alaska, Batu Tara, Chaitén, Chile, Dukono, eruptions, Guatemala, Hawaii, Indonesia, Japan, Kamchatka, Kanlaon, Karymsky, Kilauea, Kizimen, Kolokol Group, Koryaksky, Mexico, Pacaya, Papua New Guinea, Philippines, Popocatépetl, Rabaul, Russia, Sakura-jima, Shiveluch, Suwanose-jima, United States, Weekly Volcanic Activity Reports. The Smithsonian Institution/United States Geological Survey Weekly Volcanic Activity Report for 26 August-1 September 2009 is available on the Global Volcanism Program website. The following is a summary and not a substitute for the full report. New activity: Kanlaon (Philippines), Kolokol Group (Russia), Koryaksky (Russia). Ongoing activity: Batu Tara (Indonesia), Chaitén (Chile), Dukono (Indonesia), Karymsky (Russia), Kilauea (Hawaii, USA), Kizimen (Russia), Pacaya (Guatemala), Popocatépetl (Mexico), Rabaul (Papua New Guinea), Sakura-jima (Japan), Santa María (Guatemala), Shiveluch (Russia), Suwanose-jima (Japan). Posted by admin in Kamchatka, Koryaksky, NASA Earth Observatory, Russia, volcanoes. 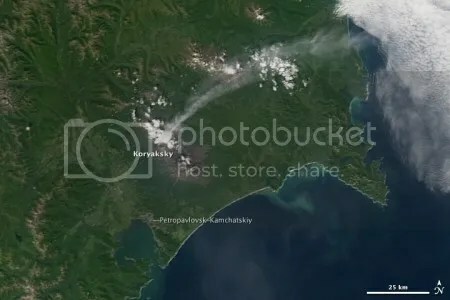 Russian volcano Koryaksky on the Kamchatka peninsula has been active recently, along with quite a few of its fellow Kamchatkan volcanoes. Earlier today NASA’s Aqua satellite passed overhead and its Moderate Resolution Imaging Spectroradiometer (MODIS) captured Koryaksky volcano producing a diffuse white plume which blows away to the east. The resulting image can be found at the NASA Earth Observatory. The city of Petropavlovsk-Kamchatsky (population 200,000) is overlooked by Koryaksky and Avachinsky volcanoes, both highly active – the image above shows clearly just how close Koryaksky is to the city. Koryaksky has been designated a Decade Volcano jointly with Avachinsky because of its history of explosive eruptions and its proximity to populated areas. Posted by admin in activity reports, Batu Tara, Chaitén, Chile, Ecuador, eruptions, Fuego, Guatemala, Hawaii, Indonesia, Japan, Kamchatka, Kilauea, Koryaksky, Mexico, Papua New Guinea, Popocatépetl, Russia, Sakura-jima, Tungurahua, Ubinas, United States. The Smithsonian Institution/United States Geological Survey Weekly Volcanic Activity Report for 19-25 August 2009 is available on the Global Volcanism Program website. The following is a summary and not a substitute for the full report. Ongoing Activity: Bagana (Papua New Guinea), Batu Tara (Indonesia), Chaitén (Chile), Fuego (Guatemala), Kilauea (Hawaii, USA), Popocatépetl (Mexico), Sakura-jima (Japan), Shiveluch (Russia), Suwanose-jima (Japan), Tungurahua (Ecuador), Ubinas (Peru). Posted by admin in activity reports, Bezymianny, eruptions, Gorely, Kamchatka, Karymsky, Kliuchevskoi, Koryaksky, Russia, Shiveluch. ‘Six Kamchatka volcanoes exhibit activity simultaneously for the first time in sixty years’, announces a story in Vostok Media today: ‘”This is a rarity. For the first time in sixty years the six volcanoes show activity”, Kamchatka scientists from the Institute of Volcanology and Seismology stated. At present they are trying to figure out the reasons behind the increase of activity of the Kamchatka volcanoes’. But which six volcanoes? The map above (adapted from the AVO activity map) shows the alert levels for the Kamchatka volcanoes, as reported by the Kamchatka Volcanoes Emergency Response Team (KVERT). The Vostok Media story lists Shiveluch, Kliuchevskoi, Bezymianny, Karymsky, Koryaksky and Gorely as the six active volcanoes in question. The last-named, they explain, may erupt soon: ‘Scientists agree that Gorely volcano might soon erupt for the first time in twenty two years. Water temperature of the lake located on top of the volcanic mountain is rising, which may well indicate oncoming eruption’. However, Gorely isn’t active at the moment, and KVERT rate it Green. 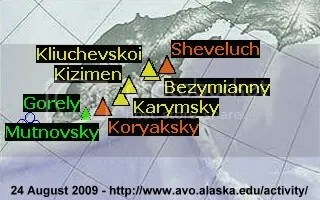 Shiveluch and Koryaksky are at Orange, and Kliuchevskoi, Karymsky and Bezymianny are at Yellow. Also at Yellow alert (since the end of July) is Kizimen: KVERT reports today that ‘Activity of the volcano continues. Strong explosive eruption possible in case of further seismicity increasing. Seismicity was above background levels on August 15 and 17-20; and at background levels in the other days of this week’ … so perhaps Kizimen rather than Gorely should have been in the Kamchatka Six. Posted by admin in activity reports, Batu Tara, Chaitén, Chile, Dukono, Ecuador, eruptions, Hawaii, Indonesia, Japan, Kamchatka, Kilauea, Kliuchevskoi, Koryaksky, Mexico, Papua New Guinea, Peru, Popocatépetl, Rabaul, Reventador, Russia, Sakura-jima, Shiveluch, Suwanose-jima, Ubinas, United States, Weekly Volcanic Activity Reports. The Smithsonian Institution/United States Geological Survey Weekly Volcanic Activity Report for 12-18 August 2009 is available on the Global Volcanism Program website. The following is a summary and not a substitute for the full report. New activity: Kliuchevskoi (Russia), Koryaksky (Russia), Pagan (Mariana Islands), Reventador (Ecuador), Talang (Indonesia). Ongoing Activity: Batu Tara (Indonesia), Chaitén (Chile), Dukono (Indonesia), Kilauea (Hawaii, USA), Popocatépetl (Mexico), Rabaul (Papua New Guinea), Sakura-jima (Japan), Shiveluch (Russia), Suwanose-jima (Japan), Ubinas (Peru). Posted by admin in activity reports, eruptions, Kamchatka, Koryaksky, Russia. Koryaksky volcano … is ejecting columns of vapor, gas and ash to the altitude of about 4,000 meters above sea level. The trail of gas and ash extends over a distance of almost 20 kilometers. Experts from the Kamchakta Volcanic Eruption Response Team told Itar-Tass the eruption does not pose any threat to nearby population centers. Tokyo VAAC issued an advisory for Koryaksky early today also reporting ash to about 4 km (13000 feet). Current webcam images (around 16:00 GMT) show a small plume and diffuse ash clouds around the peak. The KVERT updates page at the Alaska Volcano Observatory reports that the volcano is now at Orange alert status (‘explosive eruption is possible within a few days and may occur with little or no warning’). Posted by admin in activity reports, Alaska, Bagana, Barren Island, Batu Tara, Caribbean, Chaitén, Chile, Colombia, Dukono, Ebeko, Ecuador, eruptions, Galeras, Guatemala, Hawaii, Indonesia, Japan, Kamchatka, Karymsky, Kerinci, Kilauea, Koryaksky, Krakatau, Llaima, Pacaya, Papua New Guinea, Rabaul, Redoubt, Reventador, Russia, Sakura-jima, Santa María, Shiveluch, Slamet, Soufrière Hills, Suwanose-jima, Tungurahua, United States, Weekly Volcanic Activity Reports. 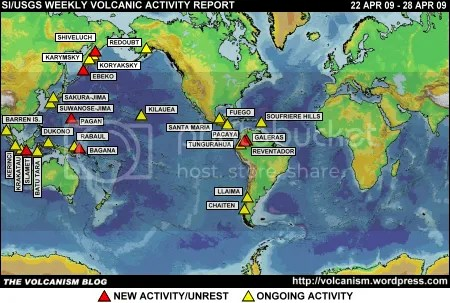 The Smithsonian Institution/United States Geological Survey Weekly Volcanic Activity Report covering 22 April 2009 to 28 April 2009 is available on the Global Volcanism Program website. The following is a summary and not a substitute for the full report. New activity: Bagana (Papua New Guinea), Ebeko (Paramushir Island, Russia), Galeras (Colombia), Pagan (Mariana Islands), Reventador (Ecuador), Shiveluch (Kamchatka, Russia), Slamet (Java, Indonesia). Ongoing activity: Barren Island (Andaman Islands), Batu Tara (Komba Island, Indonesia), Chaitén (Chile), Dukono (Halmahera, Indonesia), Fuego (Guatemala), Karymsky (Kamchatka, Russia), Kerinci (Sumatra, Indonesia), Kilauea (Hawaii, USA), Koryaksky (Kamchatka, Russia), Krakatau (Indonesia), Llaima (Chile), Pacaya (Guatemala), Rabaul (Papua New Guinea), Redoubt (Alaska, USA), Sakura-jima (Japan), Santa María (Guatemala), Soufrière Hills (Montserrat), Suwanose-jima (Japan), Tungurahua (Ecuador). Posted by admin in activity reports, Alaska, Batu Tara, Chaitén, Chile, Colombia, Ebeko, Ecuador, eruptions, Fernandina, Galapagos, Hawaii, Japan, Kamchatka, Karymsky, Kilauea, Kliuchevskoi, Koryaksky, Nevado del Huila, Pacific, Paluweh, Papua New Guinea, Rabaul, Redoubt, Russia, Shiveluch, Suwanose-jima, Tungurahua, United States. The Smithsonian Institution/United States Geological Survey Weekly Volcanic Activity Report covering 15 April 2009 to 21 April 2009 is available on the Global Volcanism Program website. The following is a summary and not a substitute for the full report. New activity: Ebeko (Paramushir Island), Fernandina (Galapagos Islands, Ecuador), Kliuchevskoi (Kamchatka, Russia), NW Rota-1 (Mariana Islands), Pagan (Mariana Islands), Paluweh (Lesser Sunda Islands, Indonesia). Ongoing activity: Batu Tara (Komba Island, Indonesia), Chaitén (Chile), Karymsky (Kamchatka, Russia), Kilauea (Hawaii, USA), Koryaksky (Kamchatka, Russia), Nevado del Huila (Colombia), Rabaul (Papua New Guinea), Redoubt (Alaska, USA), Shiveluch (Kamchatka, Russia), Suwanose-jima (Japan), Tungurahua (Ecuador).